Can you record what you see in a microscope using an iDevice. One of the Science teachers came into the staff room very excited yesterday. 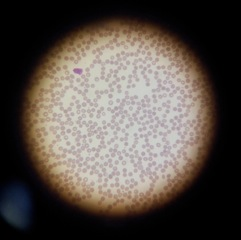 She had been working with her senior science class with the normal light microscope looking at red and white blood cells at 400X. They were discussing how they could document their experiment. 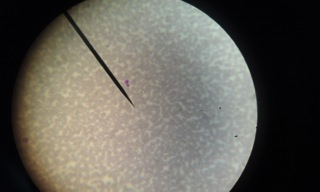 One of her students just grabbed his iPhone, placed it on the eyepiece of the microscope and took a photograph. Here are the resulting images. These images where use to grid up and count the cells before drawing the diagram. The beauty of this is not the use of technology itself but that the technology increased motivation and the subsequent task became easier to perform. The drawing and documentation became a real learning experience and the students were able to contribute to their own learning by discovering new ways of documenting their own experiments. It would be easy to take this further again. Looking at hormones under an electron microscope would give you beautiful images of crystalline structures. This opens up some great links between art and science. This is itself a discussion that has gained attention lately and one area where a cross curricula project could be beneficial to develop. These are images of hormones as seen under a microscope, from the National High Magnetic Field Laboratory at Florida State University. I would love to hear how you have used iDevices in your science lessons. Include them in the comments section so we can share these ideas with others. Science teachers do get to do some pretty cool stuff. To see what is possible check out Princeton University's 2011 Art of Science winners.